This is the follow up book to Jared Diamond’s “Guns, Germs and Steel”. “In Guns, Germs and Steel” he discusses the geo-factors that enabled Europe to dominate the world for a few hundred years. 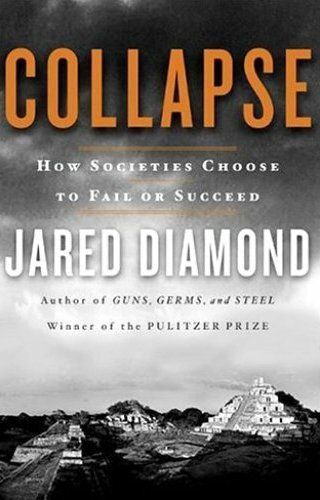 In “Collapse” he shows how people’s behaviors make the difference between a society’s success or failure. He looks at the current situations in Rwanda, Haiti, Australia, China, and the state of Montana and then compares them to ancient societies that collapsed due to environmental failure; Easter Island, the Anasazi of the Southwestern US, the Mayans of the Yucatan, and the Norse of Greenland. These ancient cultures depleted their natural resources and then disappeared from the face of the earth. Diamond believes that these collapses were not inevitable. An example of this is the survival of the Inuit society that occupied the same general area the Norse Greenlanders who didn’t survive, even though they had been there for 500 years. He discusses civilizations successful addressing of crisis in a top-down matter such as the deforestation that was turned around in Japan early in Tokugawa Era (1603-1867) and in bottom up as was done in-the New Guinea highlands and contrasts how their management of their environments contrasted to the collapsed civilizations. Increased per-capita impact of people. The book is divided into four parts, the first part is a short discussion of the environment in Montana. Part two covers societies which have “collapsed”in history. Part three looks at current societies which are in danger of causing their own collapse. In part four Diamond looks at why societies make decisions that lead to disaster. Diamond concludes the book with a summary of the most serious problems facing us today and the negative impact to us if we don’t solve them. He does gives us some reasons to hope because of the examples of societies faced with collapse that addressed their problems and survived. This is the follow up book to Jared Diamond’s ”Guns, Germs and Steel”. “In Guns, Germs and Steel” he discusses the geo-factors that enabled Europe to dominate the world for a few hundred years. 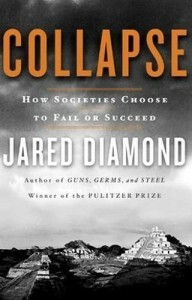 In “Collapse” he shows how people’s behaviors make the difference between a society’s success or failure.